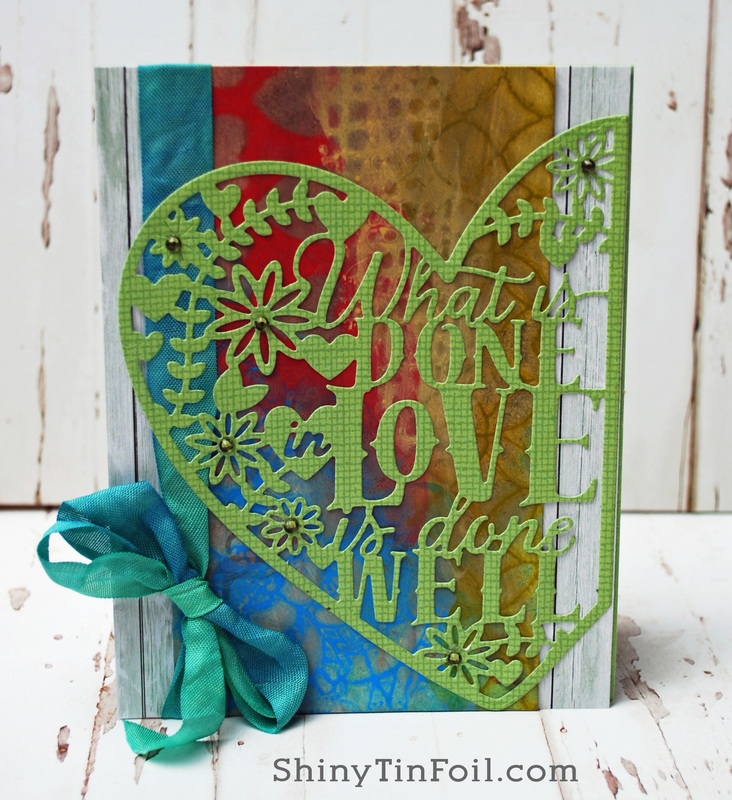 I have always liked using stencils and playing with embossing paste. So this was a fun day for me. I have a really bad head cold, so if I make a ton of spelling errors and write out strange sentences, forgive me. This one was more fun than I thought it would be. It was very relaxing just pasting the images onto the cardstock. 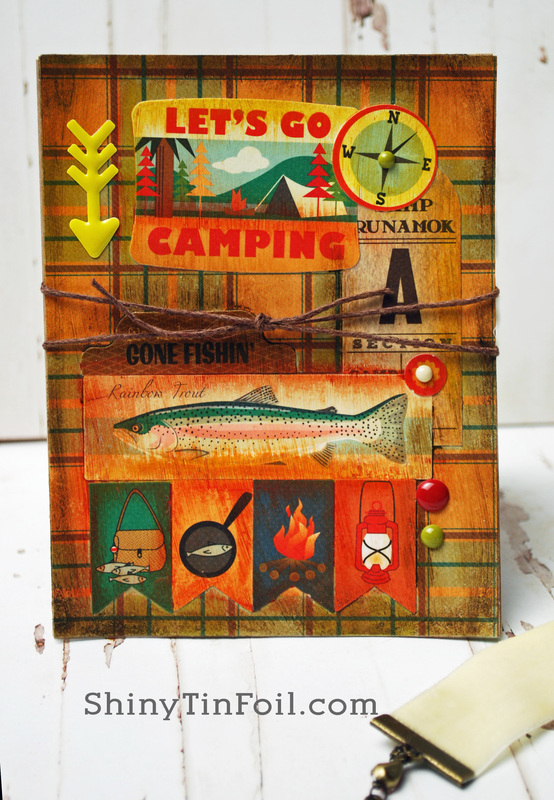 For the card I decided to do a camping theme. I had the camping Ephemera so I thought it would be fun to do a card using them. This was fun one. I could have done this all day. It was exciting to see all the different colors exploding on the background. 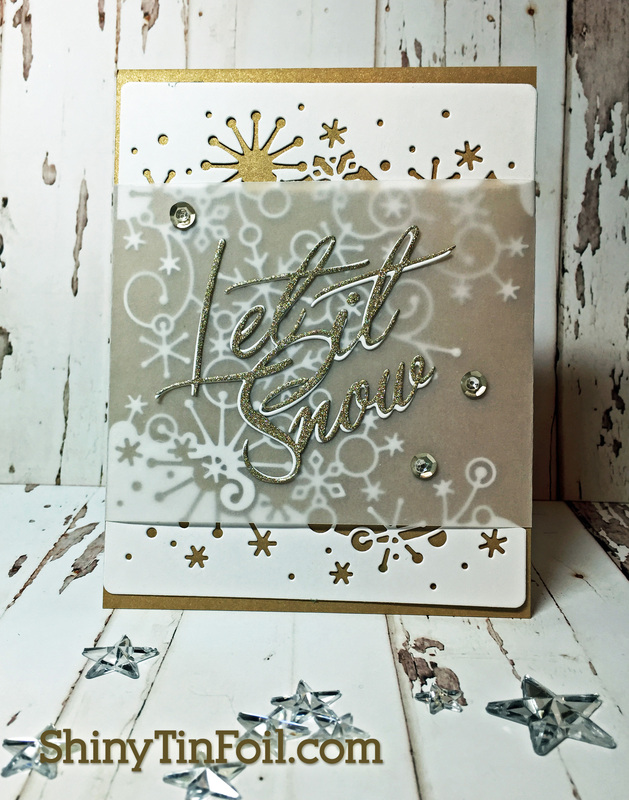 For the card I used my new starfish stencil. This picture does not do it justice. I painted a tiny starfish from the mini blueprints and added some fun do dads. If I can use GOLD on anything I am happy. 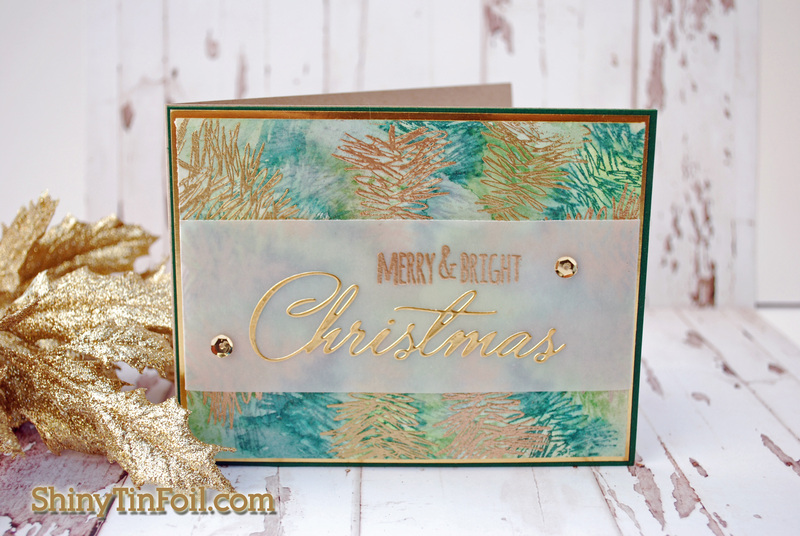 I really liked using the paste with embossing powder. For the card I used a leaf stencil and used the leaf stamp and die cut to make the rest of the card. You cannot see the gold very well in this pic, but this close up shows the shine. This was such a cool technique. I love the tile look. I decided to use dark colors instead of the Picket fence. It was such a colorful print the white just did not show up. 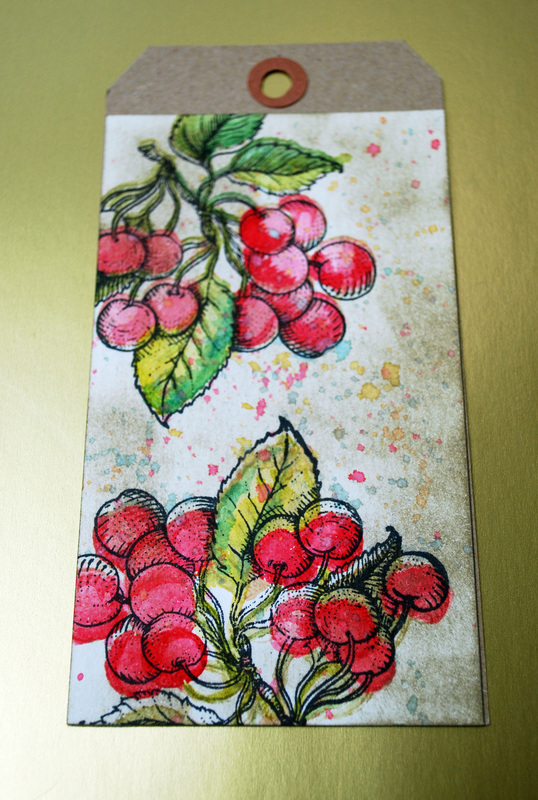 For the card I used some paper I had in my stash. 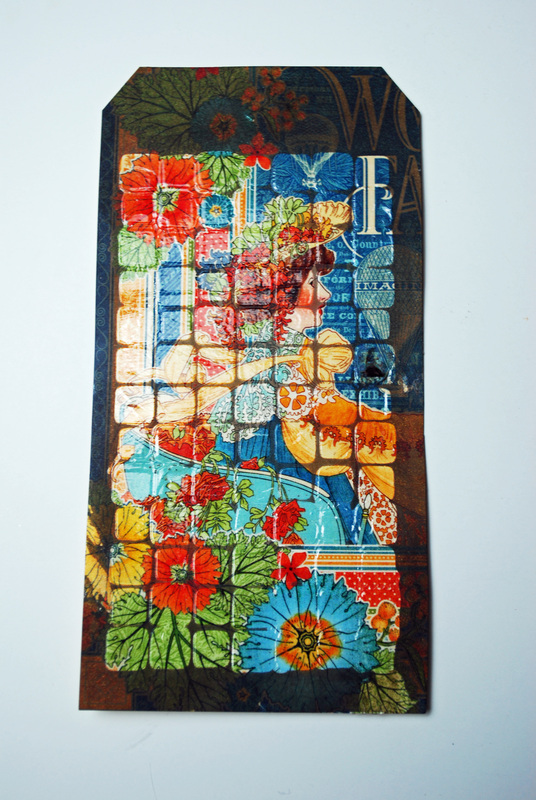 I cut the border out to make a frame and used one of the prints to make a mosaic for the middle. I thought it came out really cool. This was one of my favorite techniques. This was an interesting technique. I think it was kinda fun and grungy. 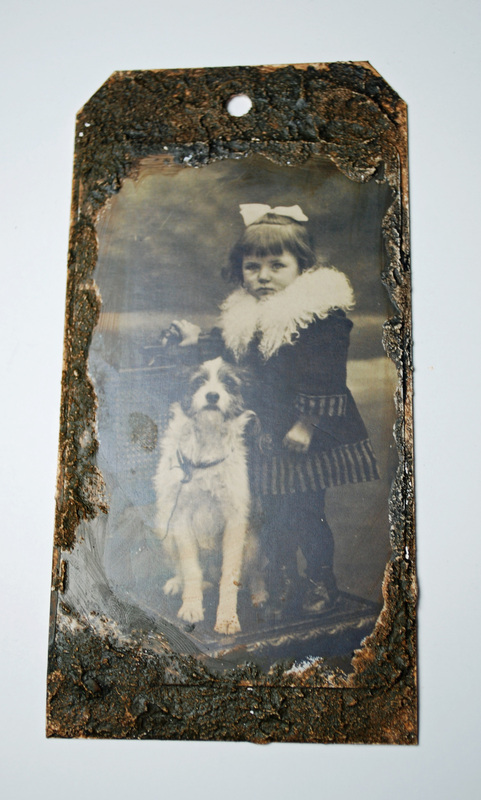 But the best part of this Lost Relative card, is that the dog looks like my Penny. 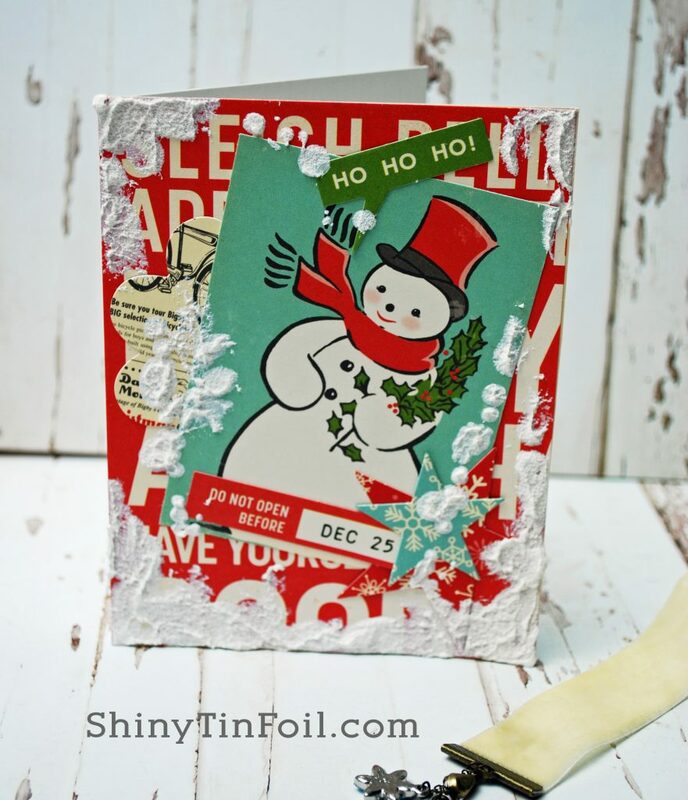 I decided to do the snow technique for the card. It really does look like snow. Yikes! It has taken me a whole week to get Day two done. Tim does not mess around when it comes to teaching us techniques. He packs a full class. 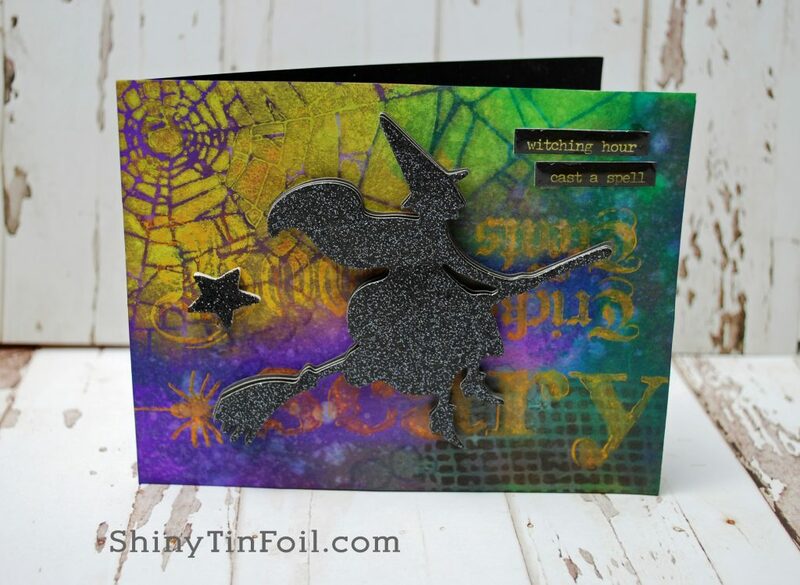 I decided on this card to go for the Halloween look. 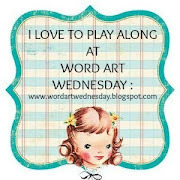 I have some older Anna Griffin stamps that had large words. 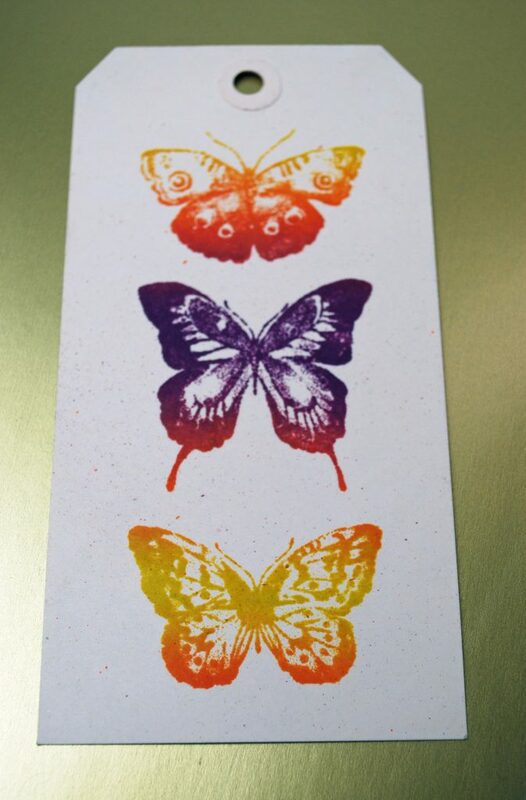 This was perfect for the tag and card. I love the broken glass stsncil and it looks like a spider web. For both the tag and card I used some valentine themed items. Not your traditional LOVE type cards, but it works for me. 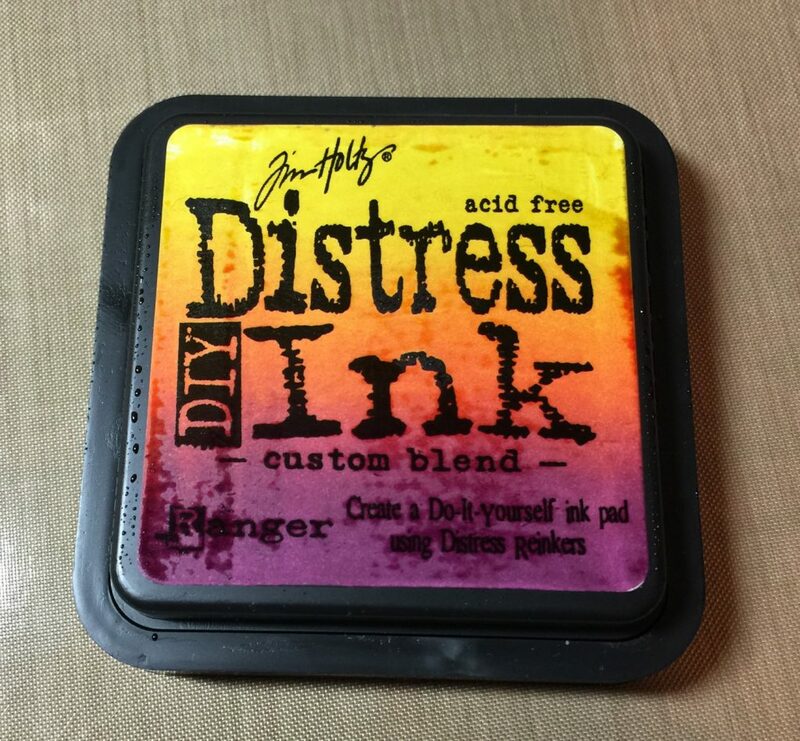 I dyed the ribbon to match the distress colors. This tag and card was hard. 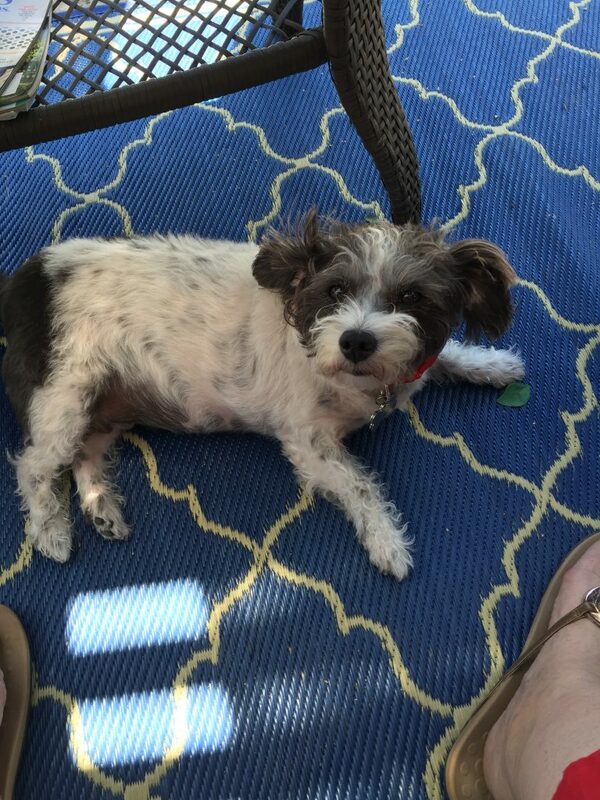 I must have had this rubon for a million years. It was almost impossible to get onto the paper. I tried heating it. rubbing it. cursing at it. I finally got it to work. So glad I did not rip the paper. I even dyed the cord with Distress Carved Pumpkin. I liked the Mica spray. This spray can be addictive. 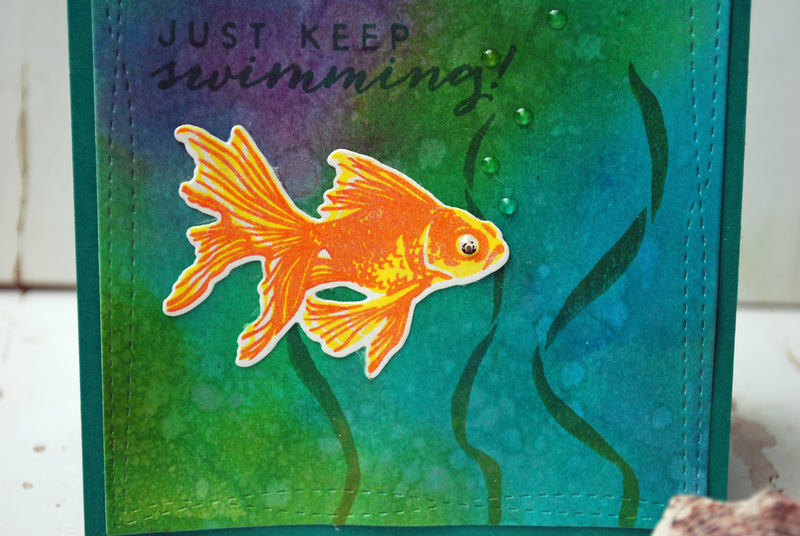 For the card I decided to used the Hero Arts Goldfish. I also added some bubbles with Glossy Accents. I know I bought a Distress Marker Sprintzer but I could not find it anywhere. I finally had to buy a new one. I search everywhere. Finally a local store had it. I was sure the moment I got home the other one would show up. LOL. I fought this spritzer tooth and nail. When I finally got the hang of it, I was pretty much done. It tends to move the marker to the side, so I was not getting any spray from the marker. Once I figured it out, it finally marked my paper. 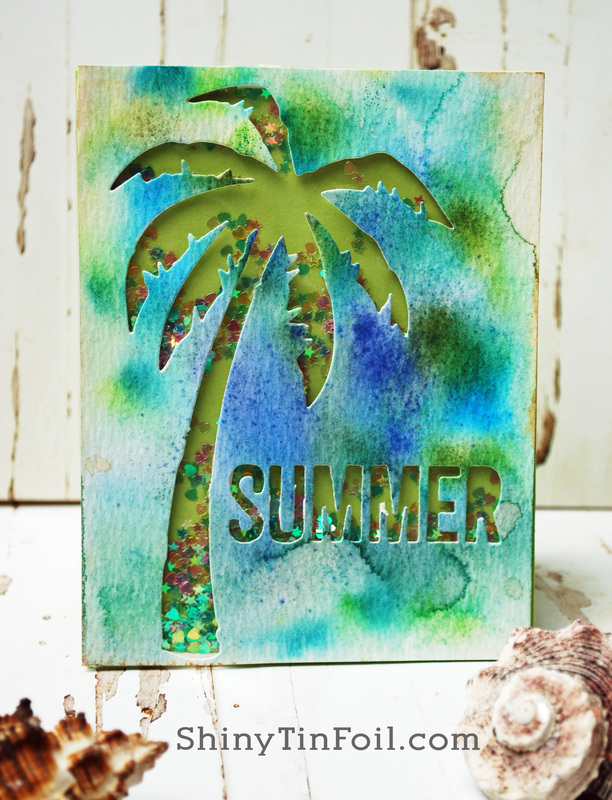 Since I just bought the Tim Holtz Summer dies, I had to make a shaker card using the palm tree and the words. Thanks you for looking at my creations. 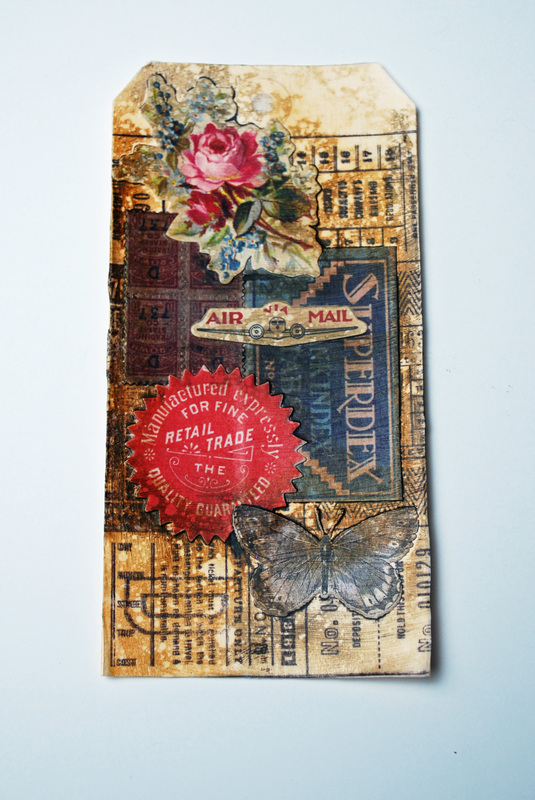 Well it comes as no surprise to me that I have been so busy and not inspired to do any cards lately. 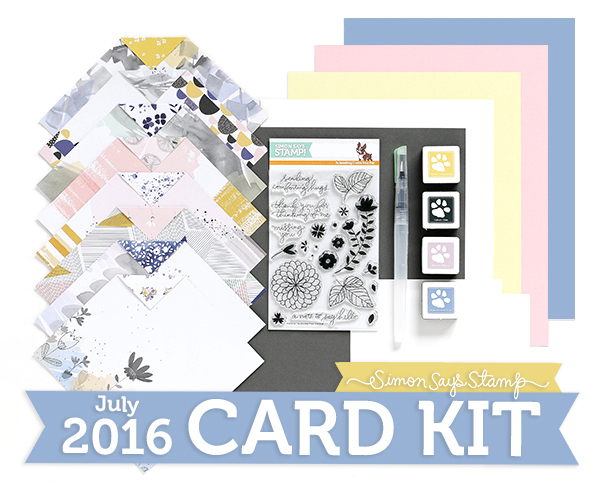 However that does not mean that there are deadlines to upload images and new card kits coming. So get a move on girl!!! I decided to do the homework from the Online Card Class Heat Wave from the SSS July 2016 card kit, killing two birds with one stone. 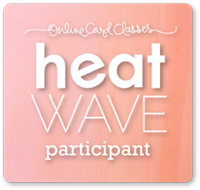 I had sketched out the ideas for my cards so it was easy to add the techniques from the Heat Wave Class to my ideas. and you get 7 cards from one kit. 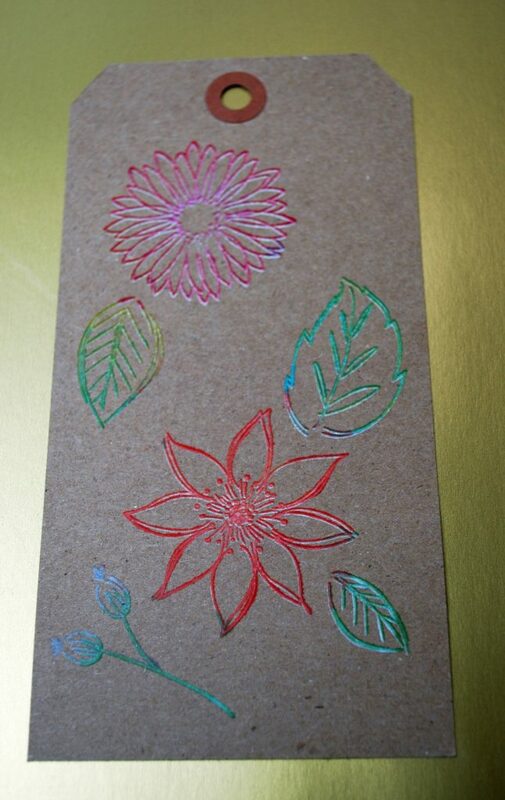 First day of class taught us some basics on embossing as well as some interesting techniques. 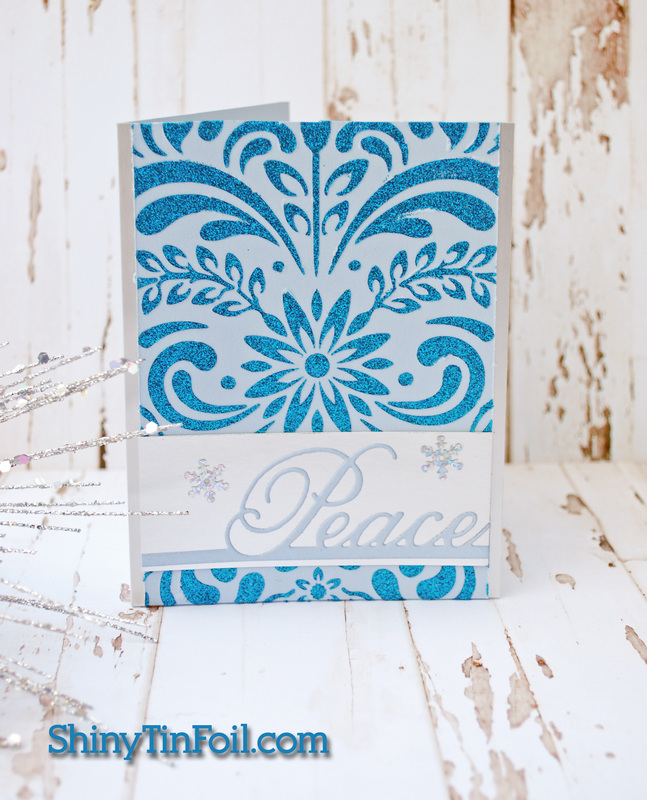 The following card is just simple embossing on watercolor paper. I tried to get the illusion of leaves floating on some water. Very Zen like. Calm. Also on the first day of class, they showed us several techniques. Some I tried, others I wanted too but did not have the time. 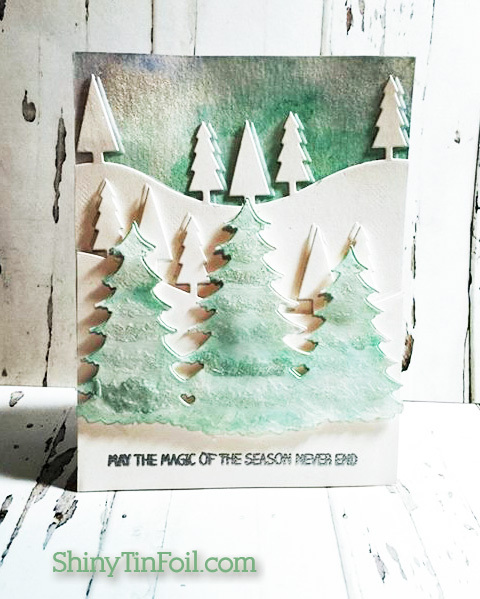 The first technique (which I have done before) is embossing a die cut. 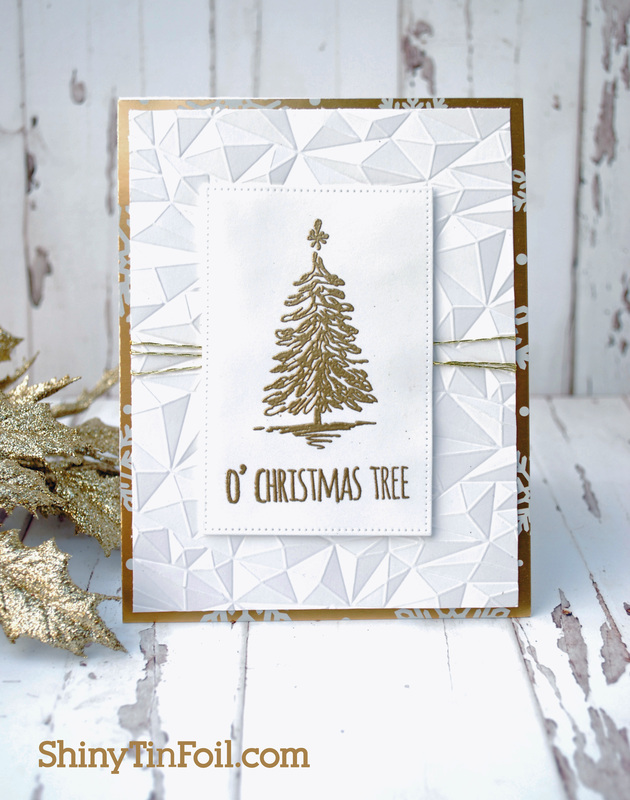 In this card I used the paper from the kit that had a lot of triangles. 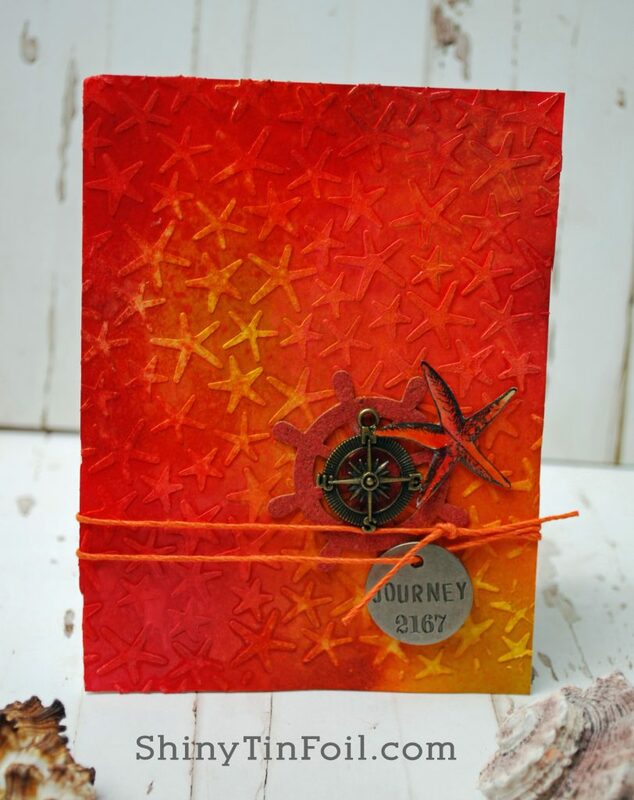 I added additional triangles and heat embossed an entire die cut. 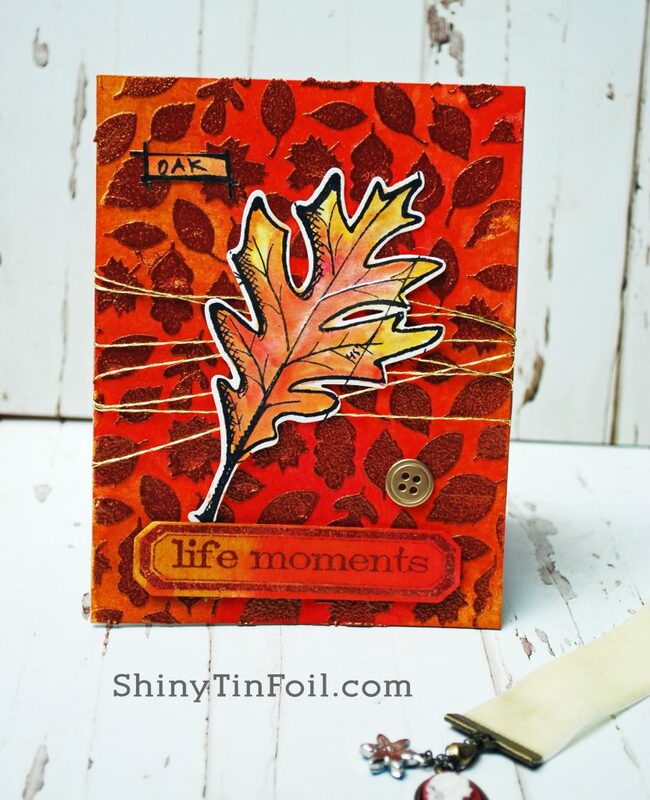 I used some WOW copper colored embossing powder. 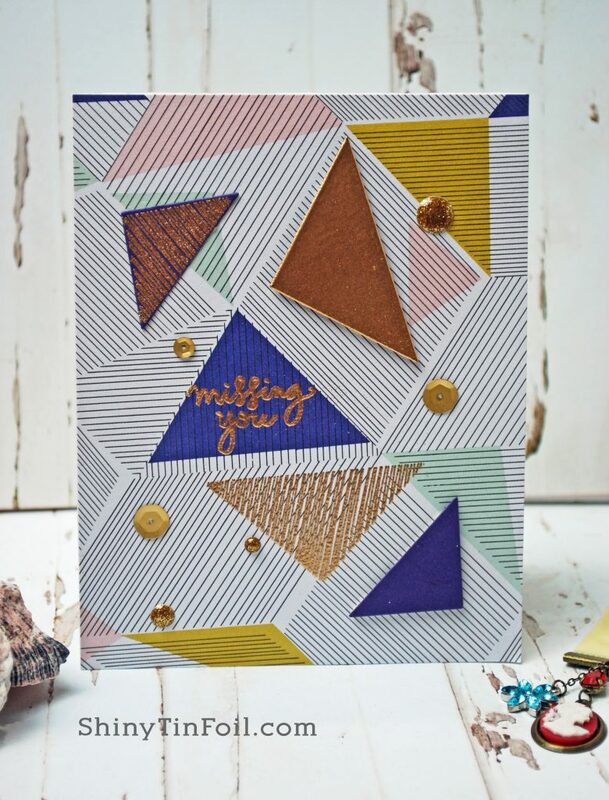 I stamped some additional triangles that were a scribble look and added some bling. 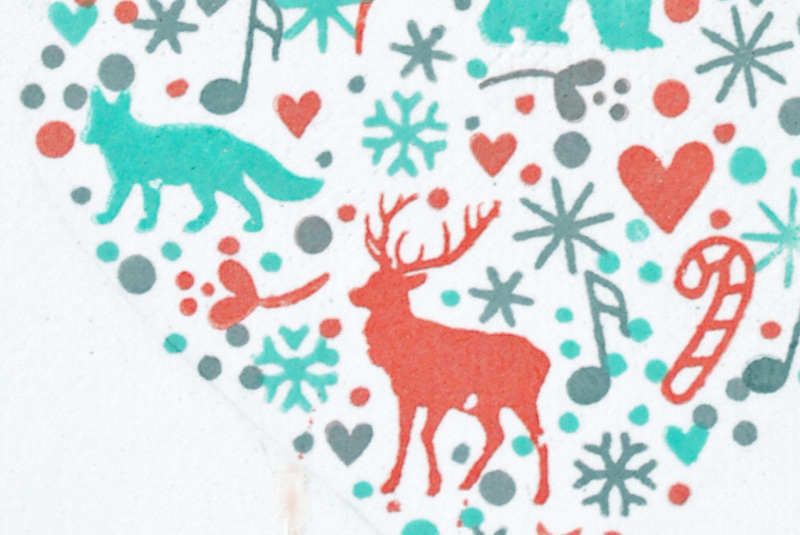 Here is a close up of the die cut. 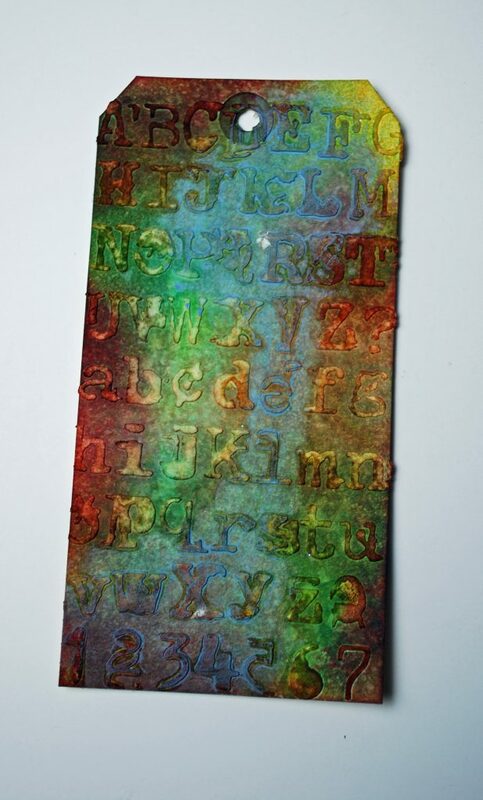 Another technique they used was glitter embossing powder. I copic colored the small panel underneath and then covered the whole thing with versamark and some glittery embossing powder. 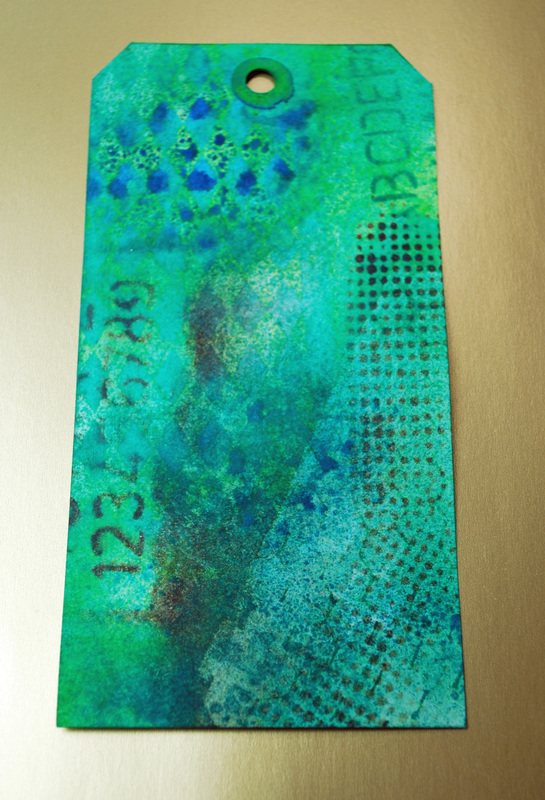 It is hard to see how pretty the card looks with the shimmer over the copics. The final card from day one was embossing on something besides cardstock. 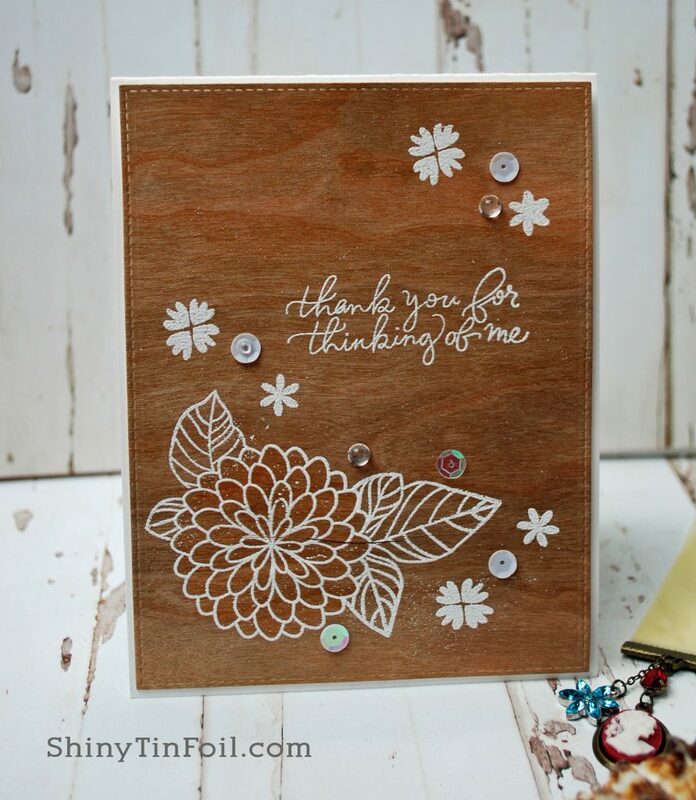 I decided to use wood veneer to make this card. The wood cracked and split on the bottom thru the flower. I am not sure if the heat was too much for the wood, or if it was a user error. Most times it is me making a mistake. I still like the card. I think the stark white on the wood is very pretty. 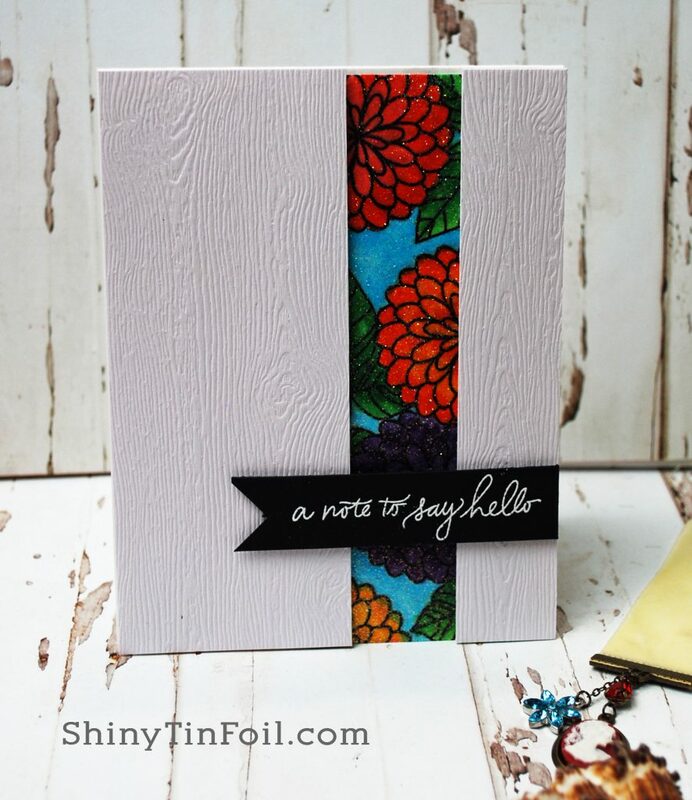 On Day Two, Jennifer showed us some pretty techniques that can add detail to your cards. I used the technique of a small strip of double sided tape and embossed it with pink powder. 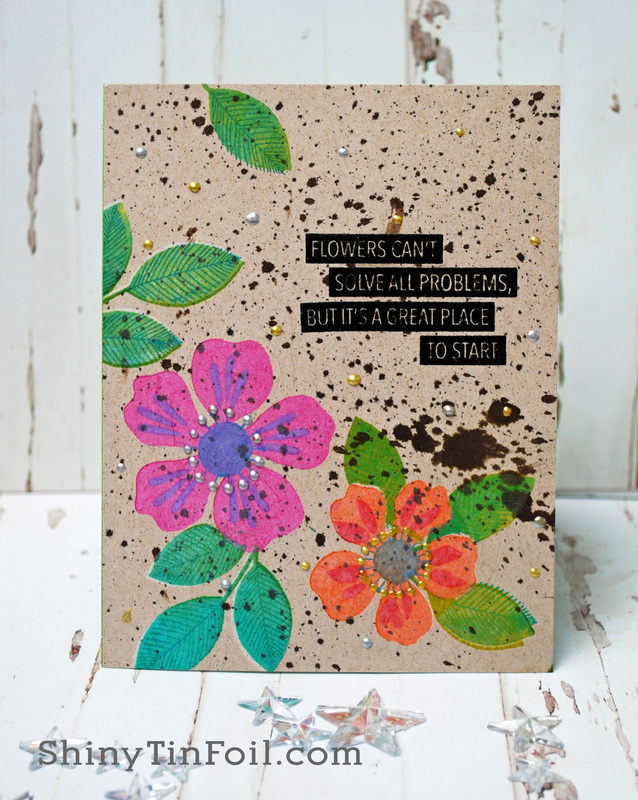 I masked off the middle and stamped the flowers using a mask so the images did not overlap. I then colored the card with some colored pencils. 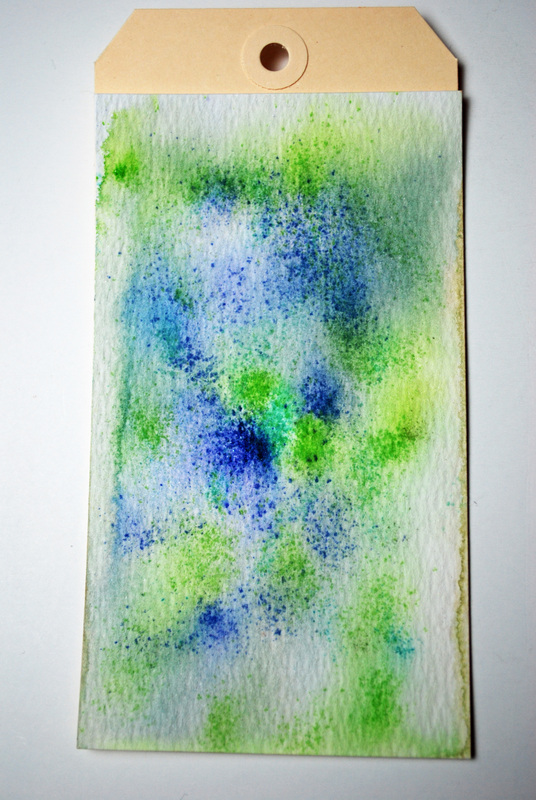 She also showed a technique of splattering water and embossing over the wet area. I really like this technique. I took the paper that already had the purple splatters and added gold splatters. 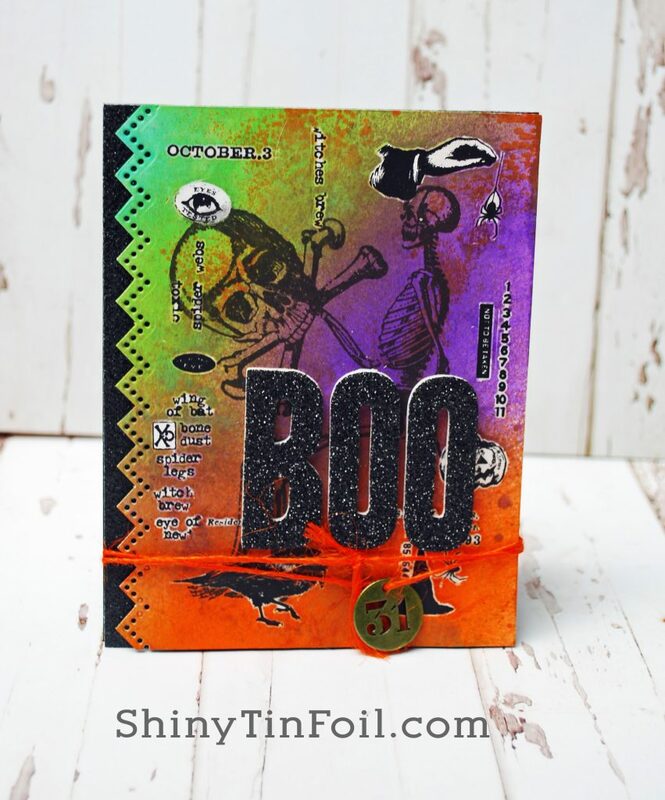 She also did the technique of using a glue pen to make little dots to add additional embossing to fill out a space or enhance an image. 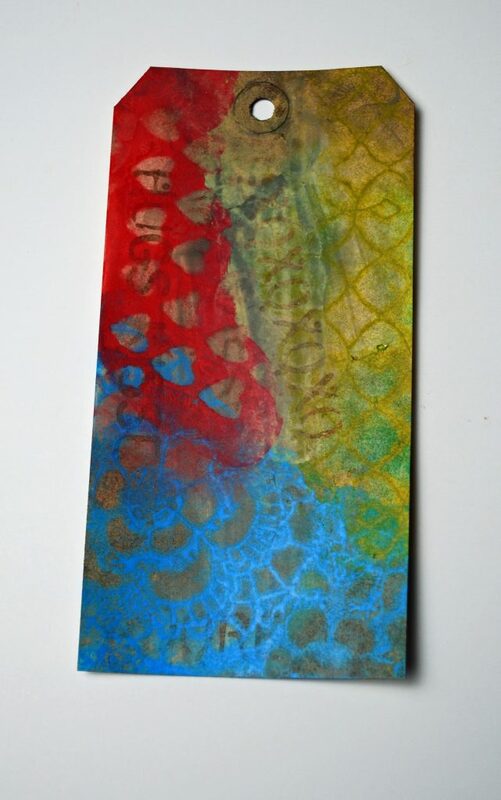 I ended up doing that on the vellum window. You can see the sequins captured behind the vellum to make this shaker card. 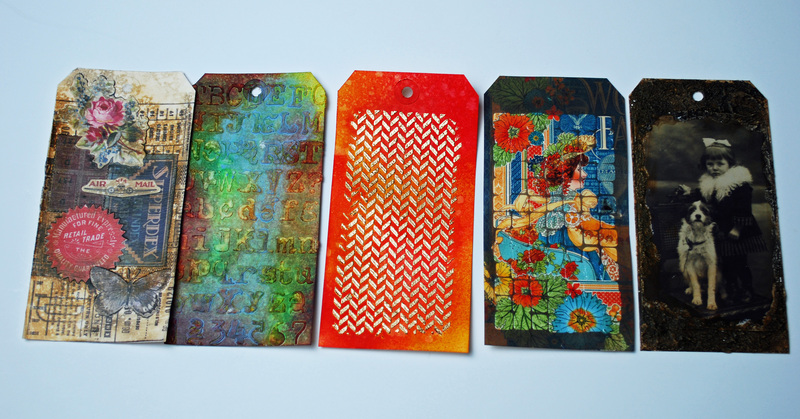 On the last day we learned about ironing off embossing powder to create a look. But the project that caught my eye was the batik looking card. 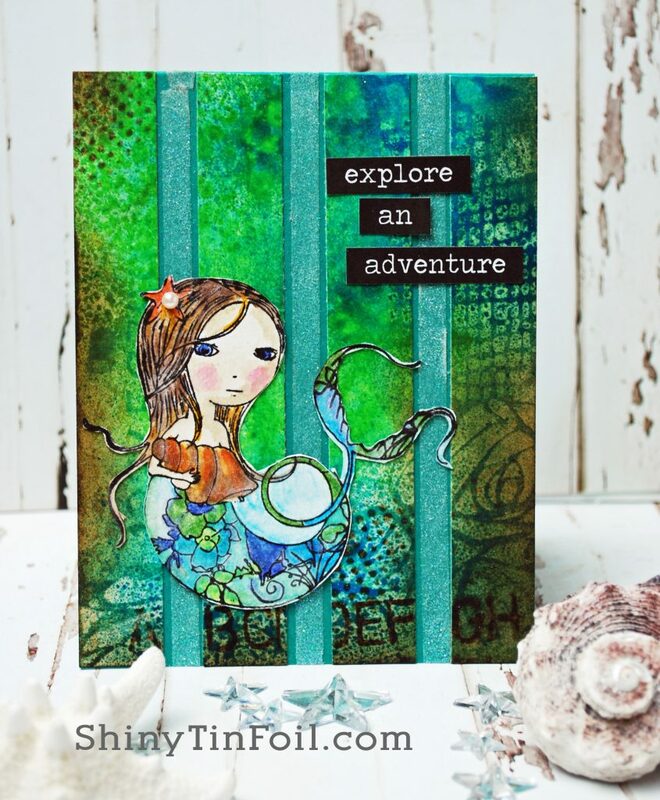 I used the stamp set to create a background and embossed in white. 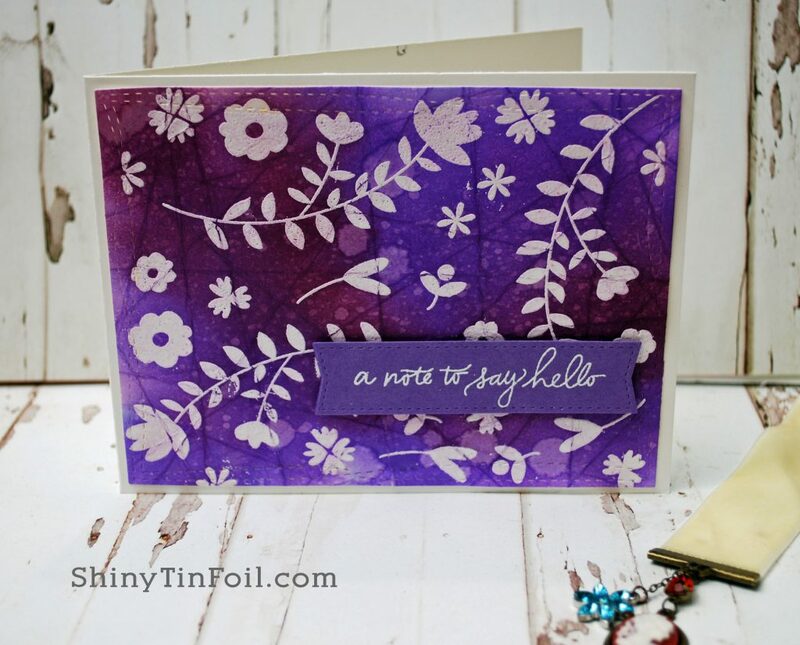 The after the fold and refold process I used three shades of purple distress ink. I always ask my brother to rank the cards and this was his favorite. His logic: Today I like purple. 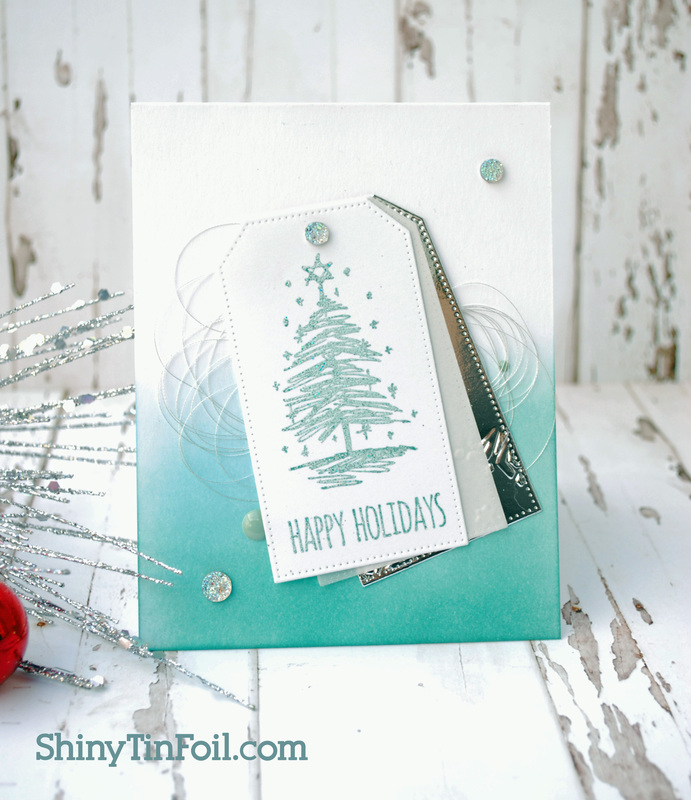 Overall I enjoyed the class and I liked this card kit. I hope you enjoyed looking at my creations! I was up for the challenge. 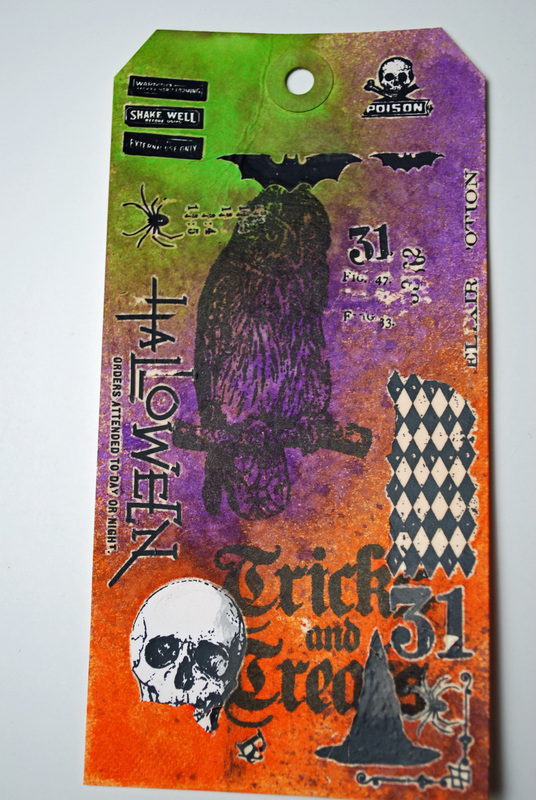 I decided to use the same stamp set they did! I did buy it thinking I really would need it for the class. At first I was not sure I should because I was afraid my cards would look the same. But I am proud to say that only one looked similar. I love taking the inspiration and going for something different. 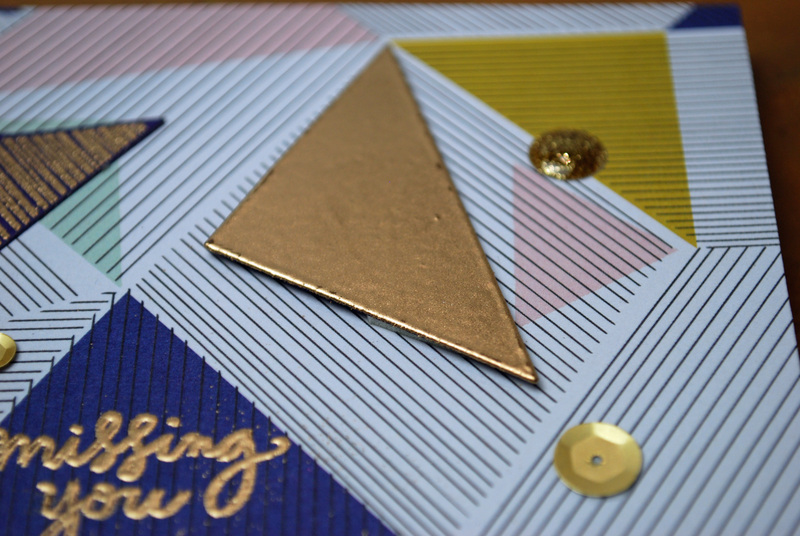 For this card I really wanted to use my embossing folder that gives that geometric look. I love it. 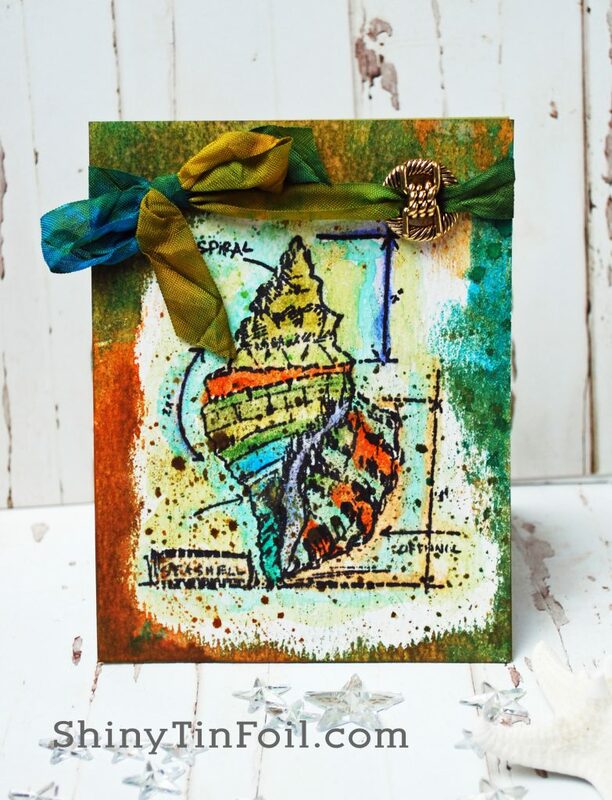 This card I really did a similar card to the instructor. 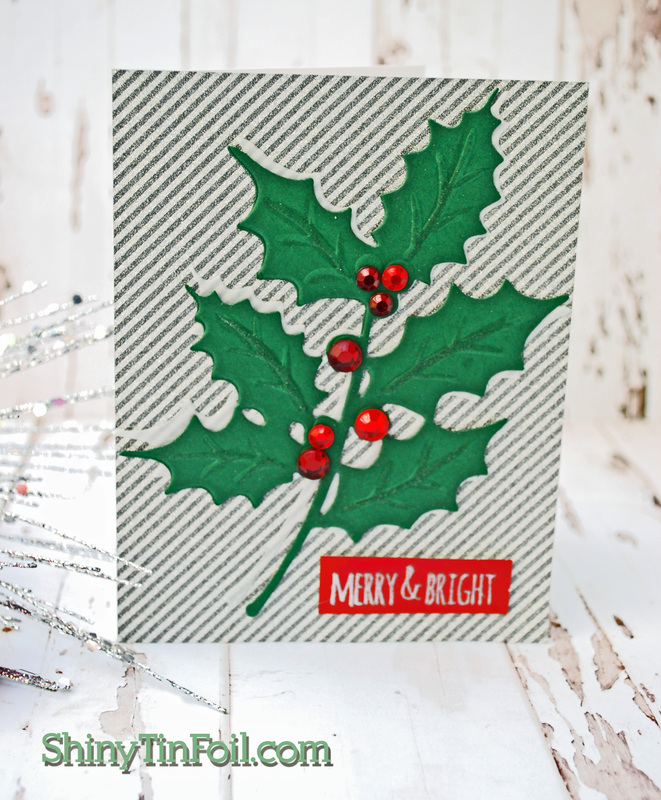 I could not help myself as it was such a pretty card. I changed it up a little and I really liked how it came out. 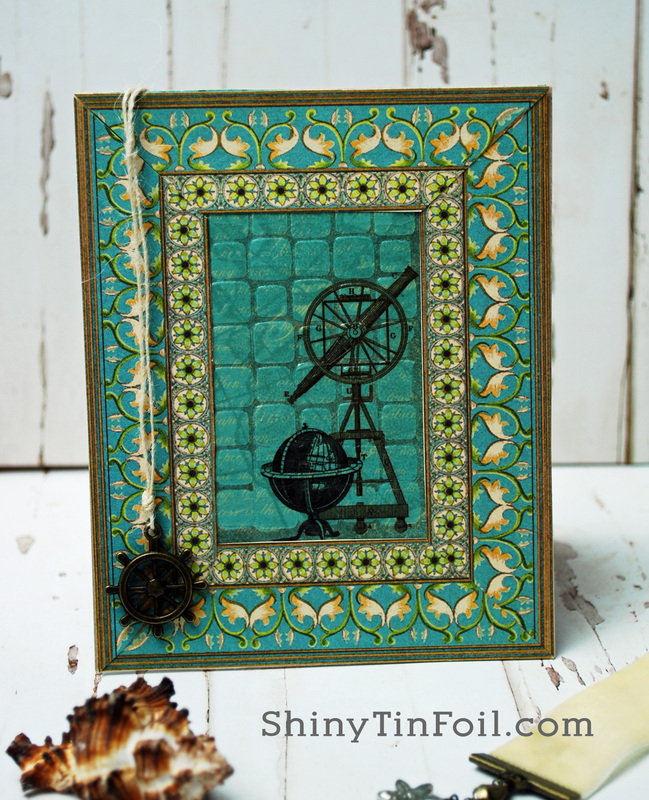 For this challenge I used a barn die I had from Papertrey Ink. 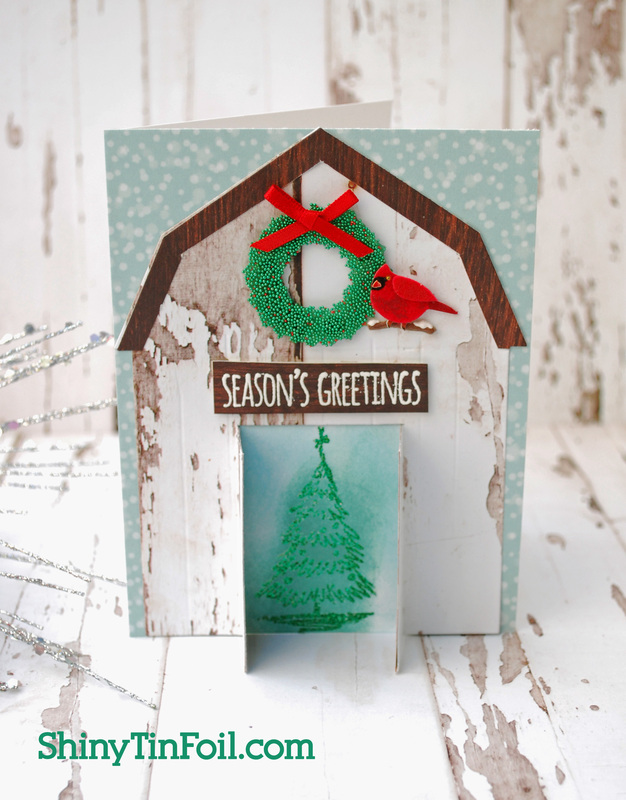 The little barn doors open to the Christmas Tree inside. I had a heck of a time finding a little wreath for the barn. I thought for sure Michaels would carry one since they have a ton of Jolie Stickers. 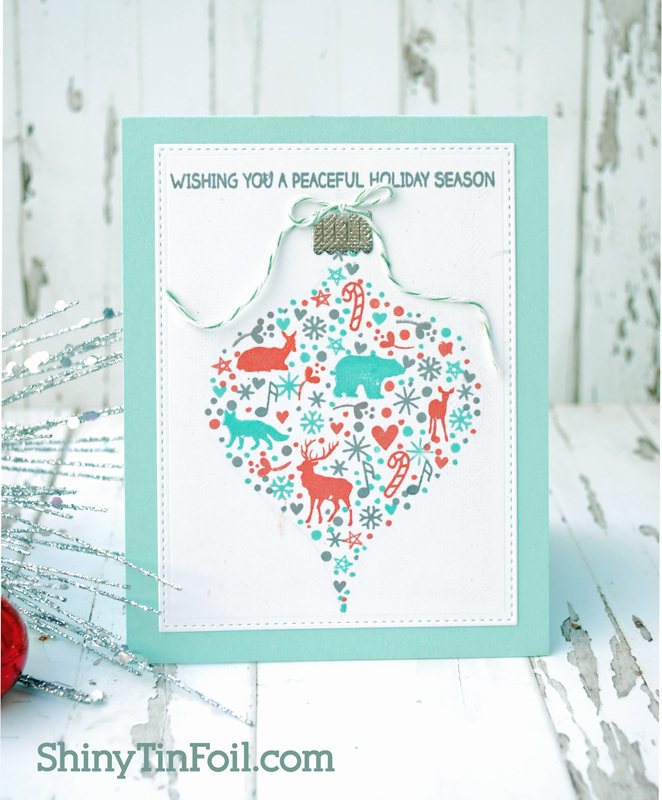 The did have this cute beaded one from their own line Recollections. I did add a little cardinal to bring in the Christmas cheer. I think it came out cute. 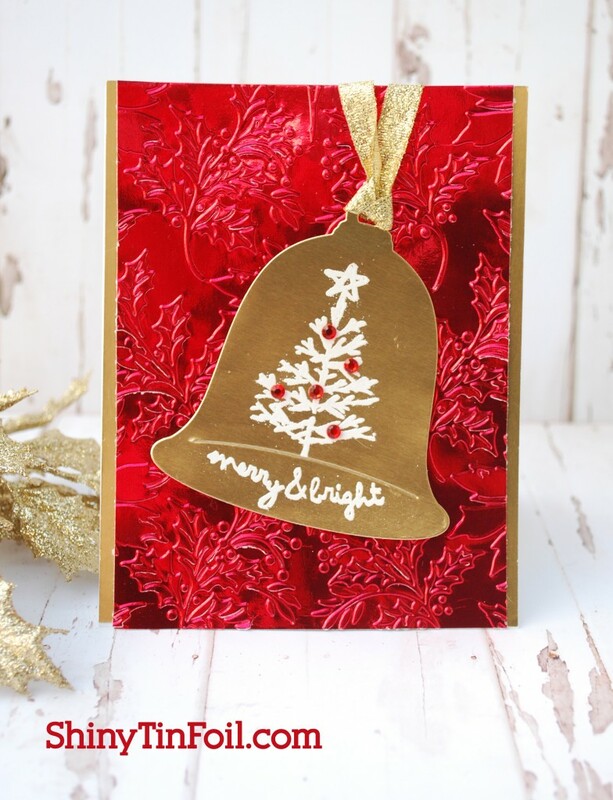 I decided to emboss foil paper for the background and stamp on the shiny bell. 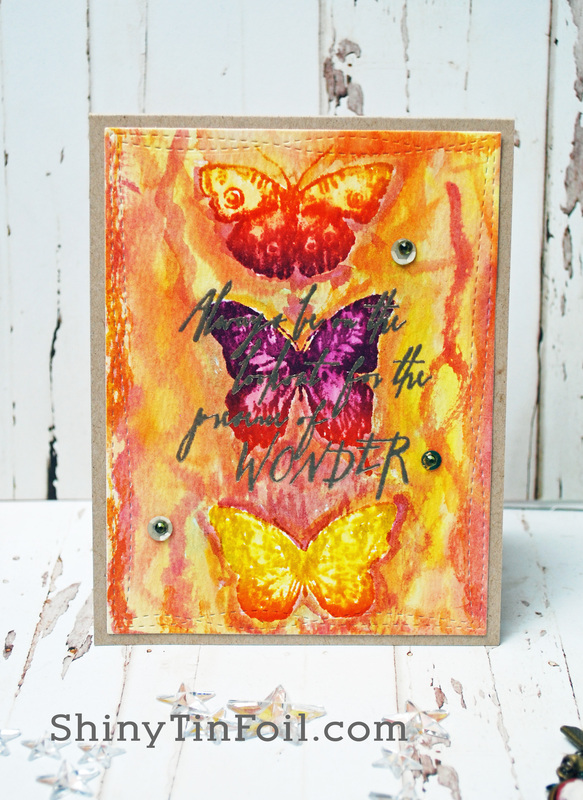 Well…..you know when you try to make a card and it just does not do it for you… this is the one. Something is just wrong with it. I don’t know what. Maybe I was tired. I did like the glittery embossing powder but that was about it. I guess I do not need to love all my creations! 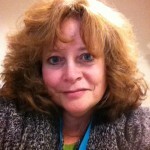 Thanks so much for looking at my creations! Please check out my Etsy Shop. I have a lot of my prior creations for sale. 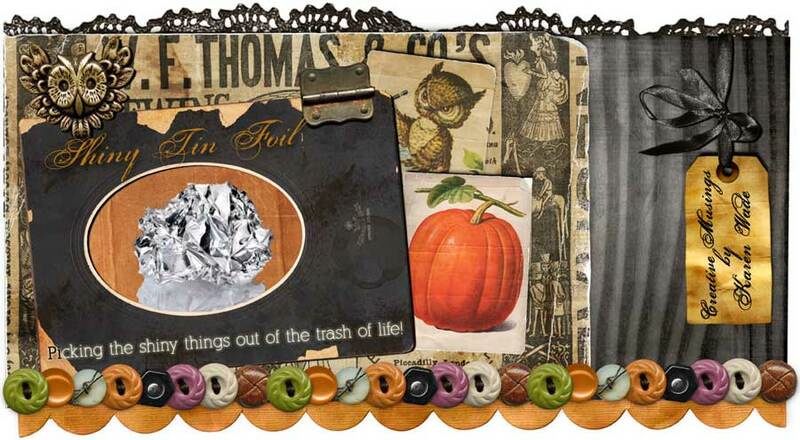 I am always adding more items to the store including goodie bags of scrapbook stuff. I was able to buy some BoBunny glitter paste at my local Beverly Fabric. Like I said in my last post, I love going there. 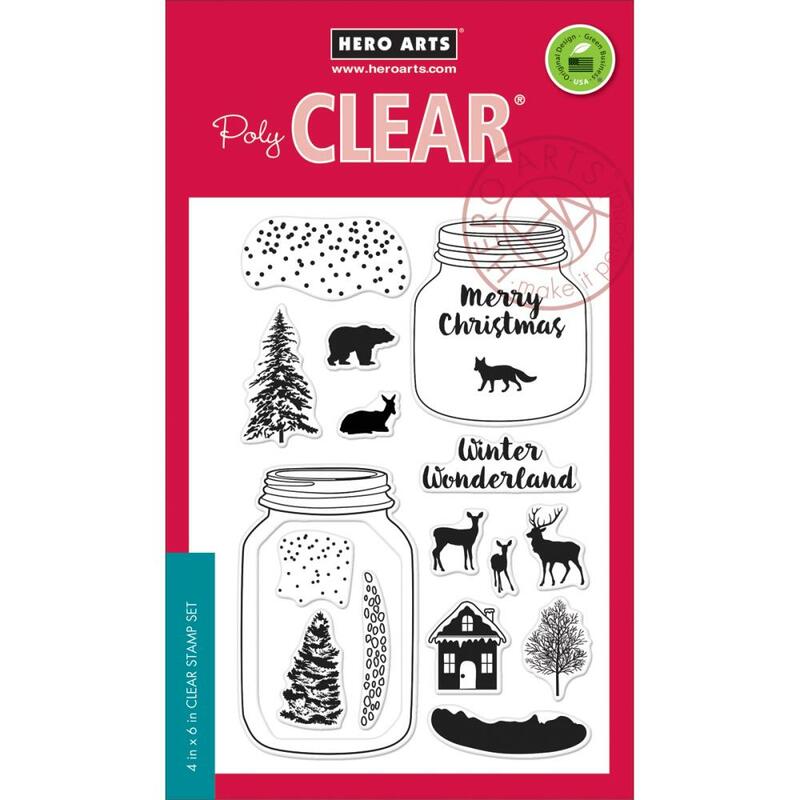 They always have the cool stuff…including this glitter paste. I got several colors because I was basically…you know…a kid in a candy shop. I had to have it all. 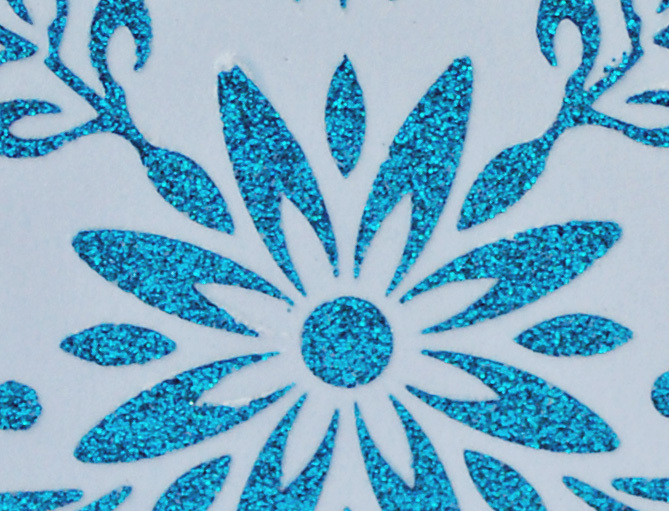 I decided to do a light blue cardstock with the Caribbean Glitter Paste. I just love the way it came out. What is hard to see on this picture is that the side and the banner are the softest mat finish silver cardstock from Anna Griffin. I LOVE her glimmer/shiny paper. I would suggest you run, do not walk to HSN and order yourself a package a it. Currently they only have the soft hues pack, but they usually have a holiday one and at least one other. Her paper is sublime!!!! 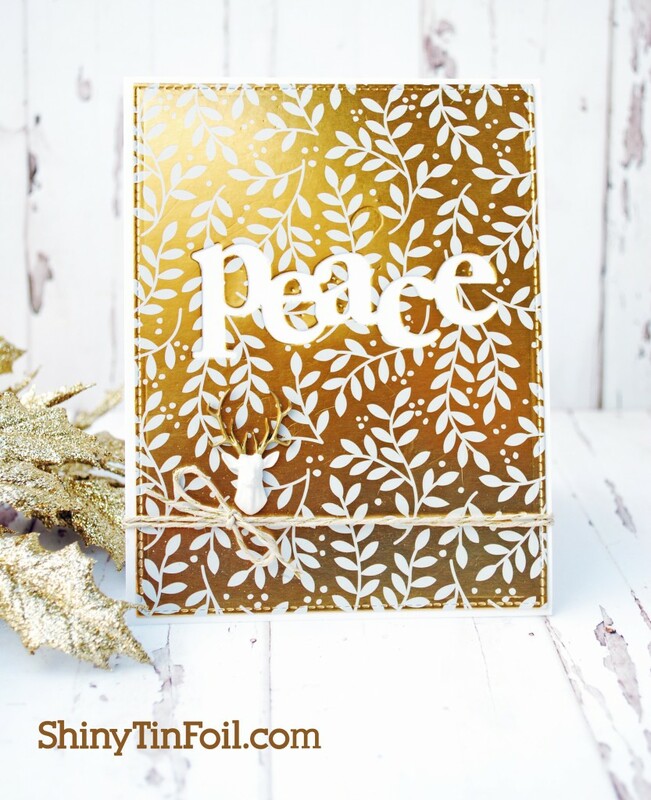 My next card, or should I say cards is using the foil shimmer technique. I went to Michaels and they had this Craft Smith brand on sale. 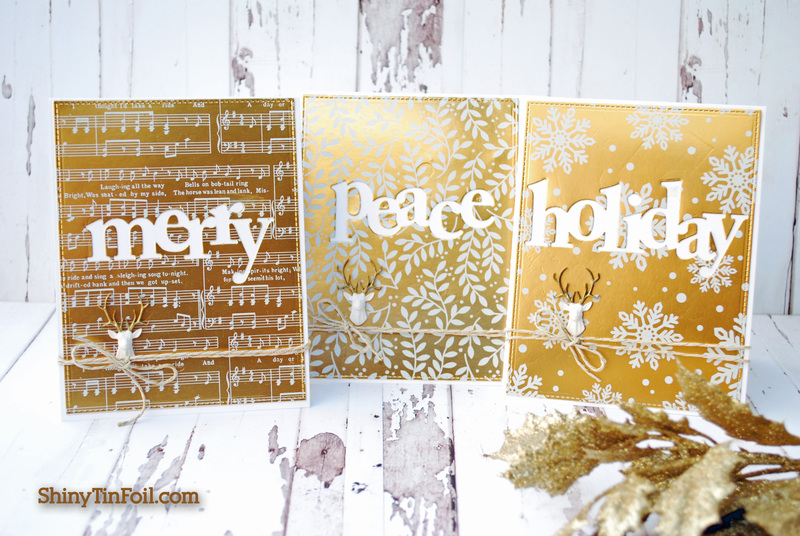 It was an entire pack of gold foil paper with different designs. Just awesome. It kinda looked like this but it was a 12×12 size with the same papers but with 36 pages. Not sure why I cannot find a copy of the paper pack anywhere on the internet. darn it. Oh well onto the card. Here is the card set. I decided to do a trio. 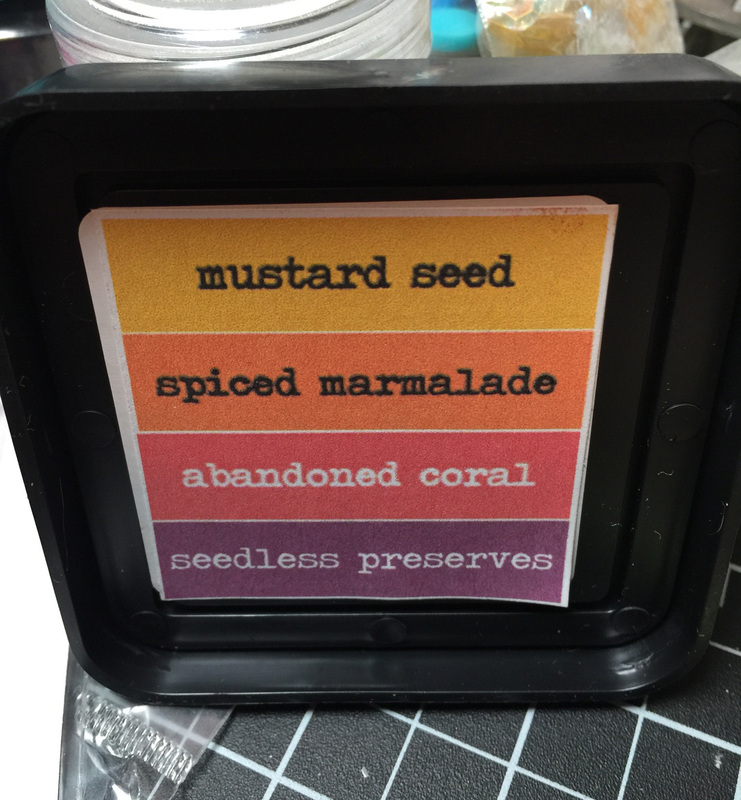 I could not decide which word die to use from this set of three dies and then I decided to just make the three cards. I added onto all three card the awesome deer heads from Little B. Yes, another great find at Beverly’s Fabrics. If you have a chance, please check out my Etsy shop. I sell my cards and other fun things. 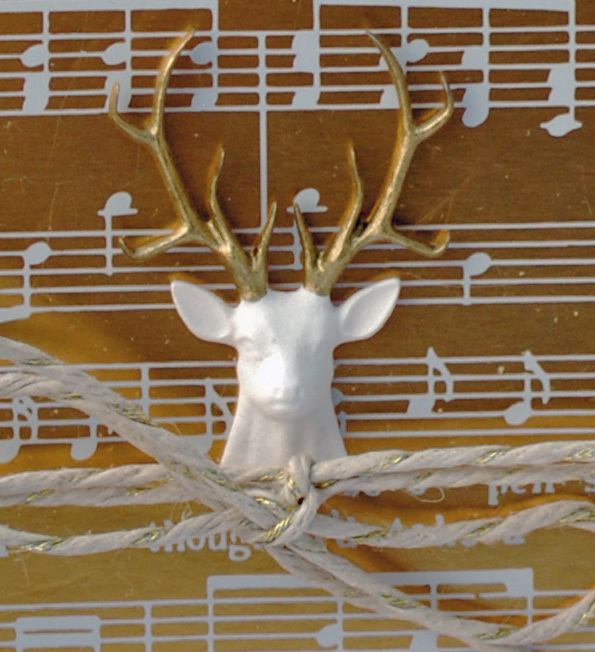 Tis the Season…. 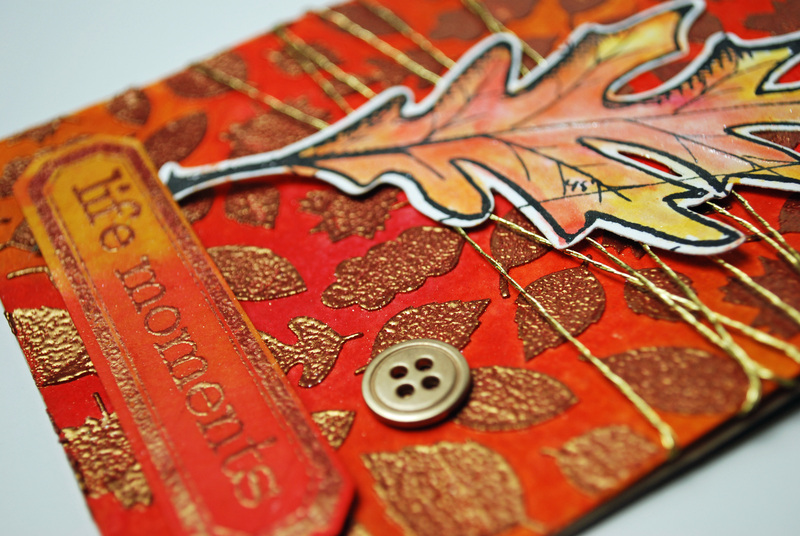 Of making cards even thou you do not feel like it. I had to force myself to make a card tonight. 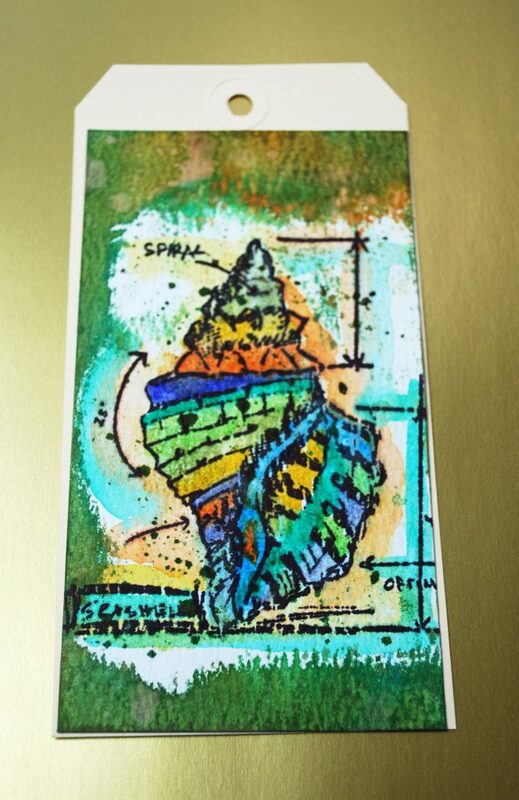 I really like the way Michelle Short made her card. It was so clean and simple that I was inspired. Of course I had to muck it up with stuff. 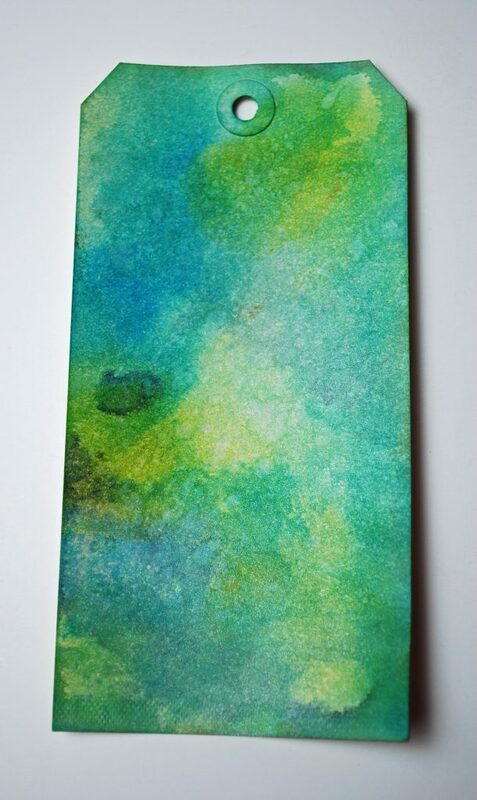 I wanted to background to look like the Aurora Borealis. Ok, I was close, not quite. Then I wanted more trees. So I got trees. With a little help of Zig glitter pen I enhanced the tree. My inter creative person was screaming…STOP, STOP…you are doing to much. Thank God I listened to her. It is a little busy but I do like the look of it!!! This day is all about making cute cards with critters. 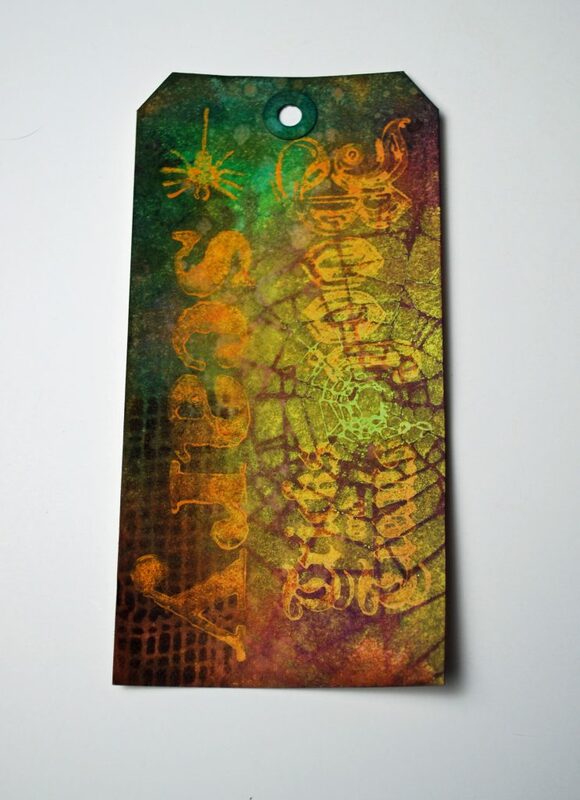 I have a lot of critter stamps so this was super easy to do. I ended up doing this card in sections. First of all I ink blended the background, covering the lamp glow with a post-it note. It kinda looks like a moon, but I think you get the idea that it is the lamp glowing. 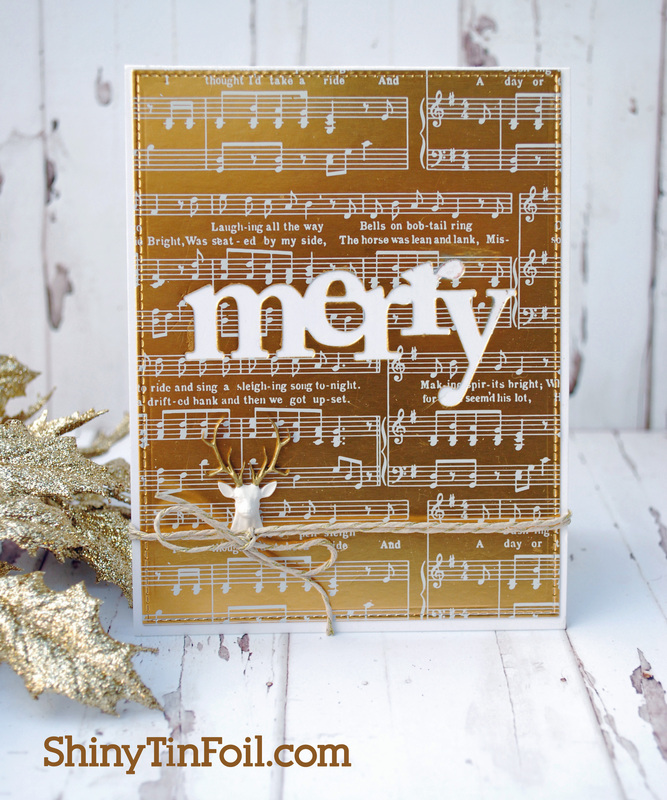 Then I stamped a Christmas Music Sheet on the background in versamark. You can kinda see it in the close up. I wanted the feel that the rabbits were caroling. I also used Glossy Accents in the lamp shade to give the illusion of glass. The I added the hills and the rabbits. And the sentiment. I finally added snow from modeling paste. 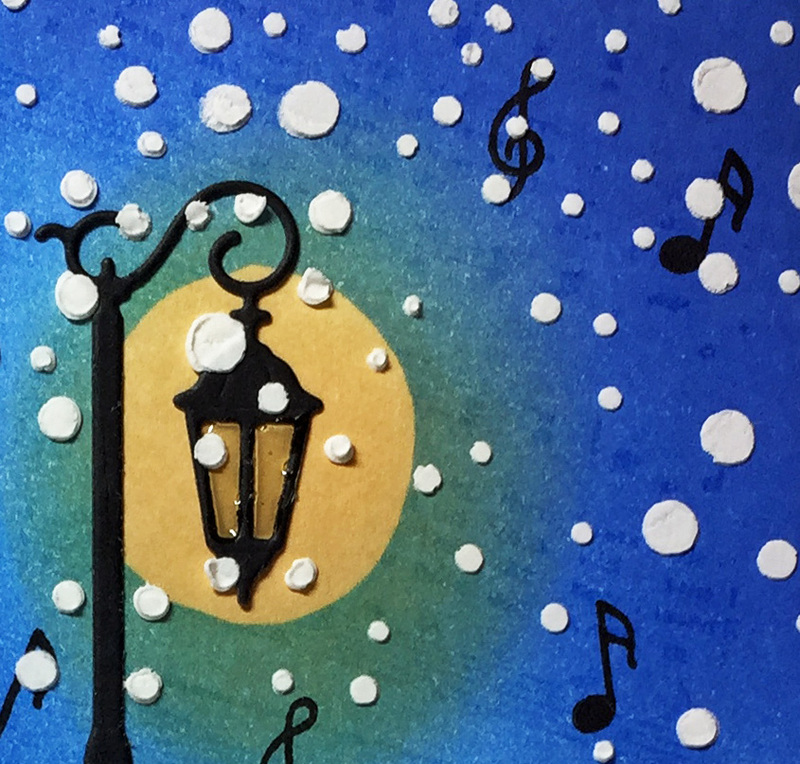 I was ok with the snow falling on the critters and the lamp because that would happen in real life. 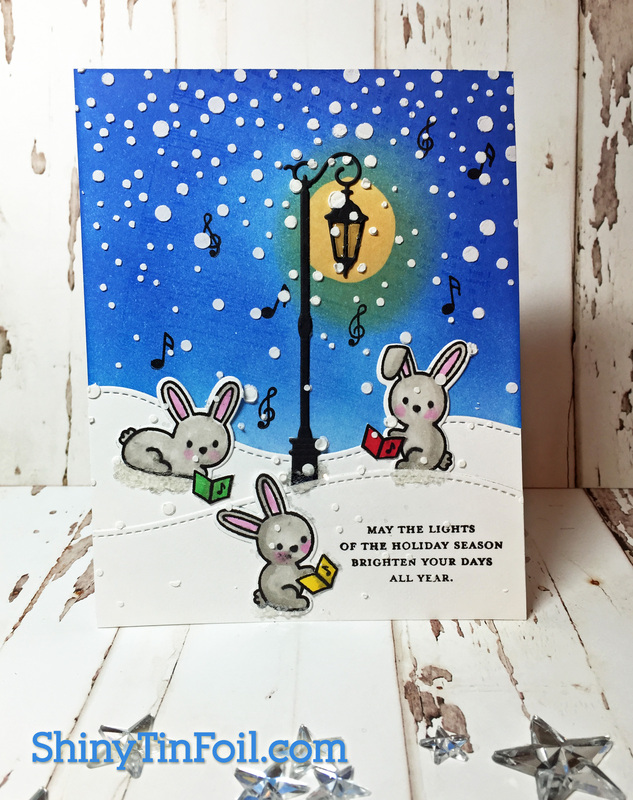 I am sure if you saw three bunnies caroling in the snow you would see the snow fall on them. Please let me know if you actually see three bunnies caroling, better yet, take a picture. Then I added some snow under the bunnies (not so sure I like this). Then I added some music notes. I hope you enjoyed my card. Thanks for looking. 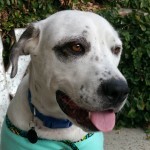 Please check out my Etsy site. The button is on the left hand side. 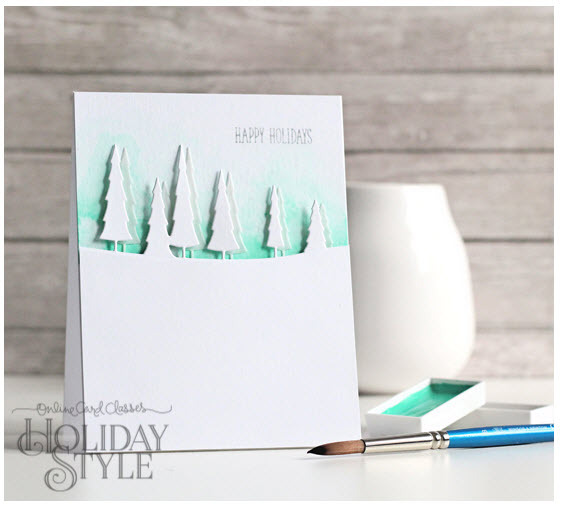 Day three had a ton of great ideas for making cards to look elegant. I was in awe of all the pretty choices and boy were they diverse in style. Instead of taking inspiration from one card in particular, I decided to just go with the flow and find my own class and elegant look. 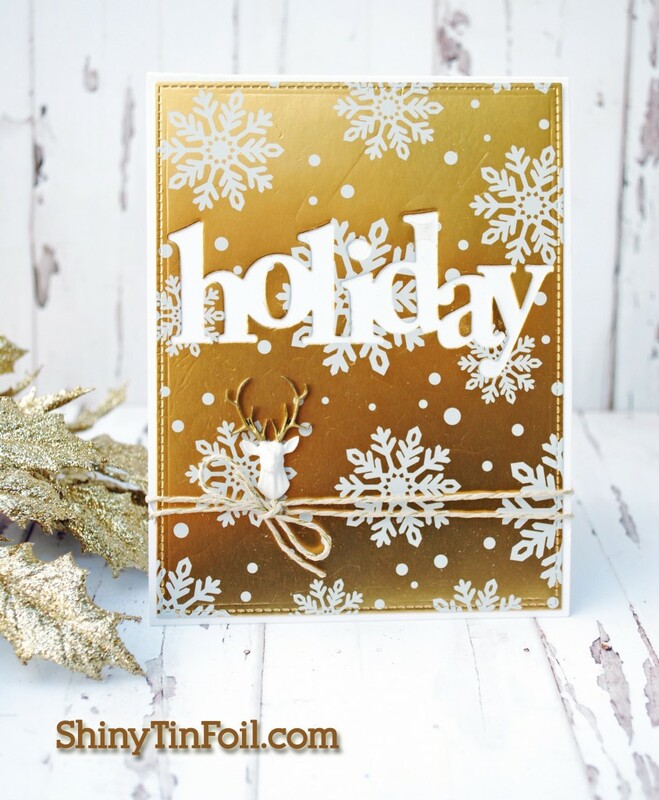 I started out with a beautiful gold shimmer card stock. God Bless Anna Griffin for making such beautiful shimmery card stock. I wish all the others would take note and do the the same. 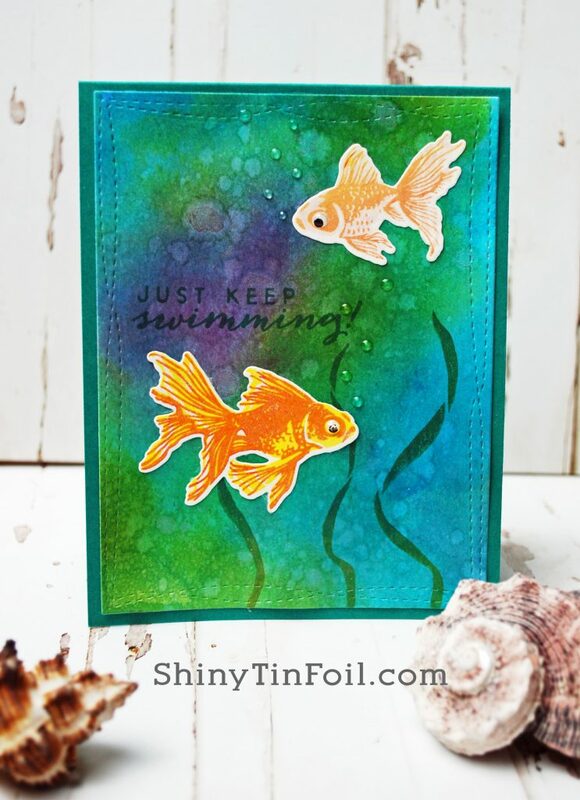 I cannot, I repeat, cannot get enough of shimmer metallic card stock. Then I took an beautiful die from Memory Box called Swirling Snowflakes to create a white snowflake overlay. 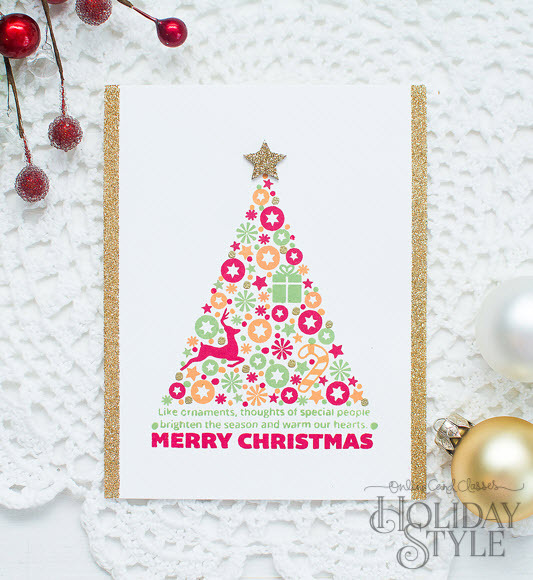 Then using Papertrey Ink Christmas Cheer Die I cut out a white card stock and glitter paper (Tim Holtz) and offset them together to create the center of the card. 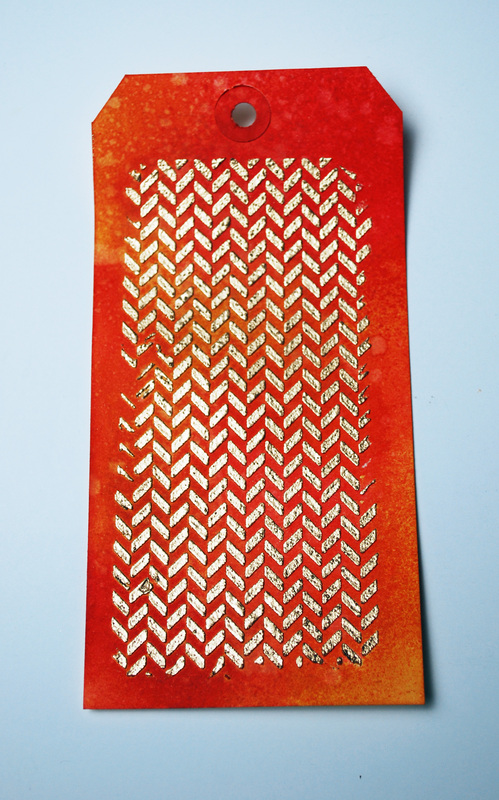 To let it stand out more, I placed a band of vellum across the card. I finished with some sequins. Just a note on the Papertrey Ink Christmas Cheer Die. I love, love, LOVE the retro style, 1950’s style writing of this die set. Thanks so much Papertrey Ink. Please feel free to design more word dies with this awesome font. I just cannot get enough of it. 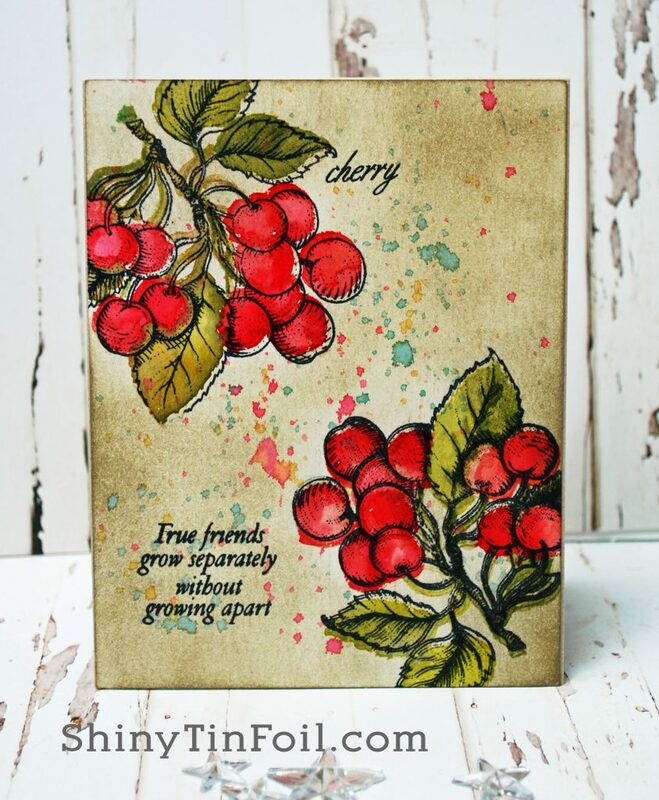 Please check out my Etsy shop, I am selling a lot of my cards!